You have taken several 100 pictures and videos during your holiday - what's next? You would't look at them again or give a presentation to friends if all pictures and videos had just been copied into one folder without sorting out the worst shots and editing the rest. Less is more (especially if you have worked frequently with the continuous shutter mode)! Create a new folder on your hard disk and copy all files from the memory cards into it (eg. C:\YourName\Documents\Photos\2008\Holiday\Maldives). Cameras usually save photos in the JPEG format which compresses the image to about 1/10 of the original size. The quality slightly worsens every time you edit and save the image again (recompression loss). In theory you should do all post-processing steps consecutively and save the image just once in the end. But as home user this minor quality loss is insignificant so that I am going to describe the convenient way. Sift through your photos and only keep the best. I usually delete 60-70% of my shots. Load the first photo into "Windows Picture & Fax Viewer" (the default Windows XP image viewer) or "Windows Photo Gallery" (Windows Vista). Rotate portrait photos by pressing "Ctrl+K [clockwise], Ctrl+L [counter-clockwise]" (Windows XP) or "Ctrl+Period (.) [clockwise], Ctrl+Comma (,) [counter-clockwise]" (Windows Vista). Create a new subfolder "Favourite photos" and move the excellent photos in there (about 1/4 of the best). Create a subfolder "Originals" below "Favourite photos" and put a copy of all excellent photos in there before you are going to edit and save all photos under their original names. This enables you to come back to the unedited version some weeks, months or even years later. Move all videos to the subfolder "Videos". I use "Photoshop", the market leader for image manipulation. Photoshop Elements is the low-price version of the full product with slightly restricted functionality (but fully adequate for our needs). You could also use the free software Paint.NET. 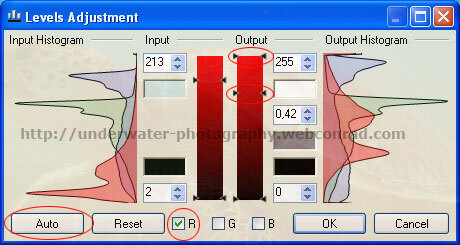 Although it offers fewer tools to edit images than Photoshop I personally find it more difficult to use. You should keep the 4:3 ratio during the cropping process to be able to easily order prints at any time. Underwater photos are usually dominated by blue and green tones so that you have to accentuate the reds in the next step. Photoshop analyses the image and adjusts the white and black point. The resulting image is of higher contrast and less blues and greens. If you like it you're done. If you think the reds are now too dominant you can manually adjust the red channel. Click on "RGB" and choose "Red". Move the grey and white sliders to the right until the image looks best. Auto levels rarely doesn't work at all: On those occasions click on "Cancel" and reopen "Levels" (Ctrl+L). You now have to adjust each channel manually. Move the black and white sliders inwards until they touch the histogram. The grey slider in the middle helps you with the fine tuning. Paint.NET works similar to Photoshop: Deselect green (G) and blue (B) and move the two sliders a bit down (see screenshot). Save the image via File > Save (Ctrl+S) in Photoshop (Elements) with qualitiy set to "Maximum (10)" and, in Paint.NET set to "90". A 6 megapixel photo needs about 1,6 MB of storage space. You should't scale down your excellent photos (see step 3) to be able to order prints in poster size any time later. But there is no need to keep full size versions of the rest of the photos. Download the free software Easy Thumbnails and scale down the photos to 3 megapixel (2048x1536) and save about half of your storage space. Open Easy Thumbnails, select the folder you want to scale down and click on settings (see screenshot). Max width: 2048, Max height: 2048, Resize: Shrink to fit, Algorithm: [Smart], Prefix/suffix: (empty), JPEG quality 90 - Click on "Make All" to start the process. 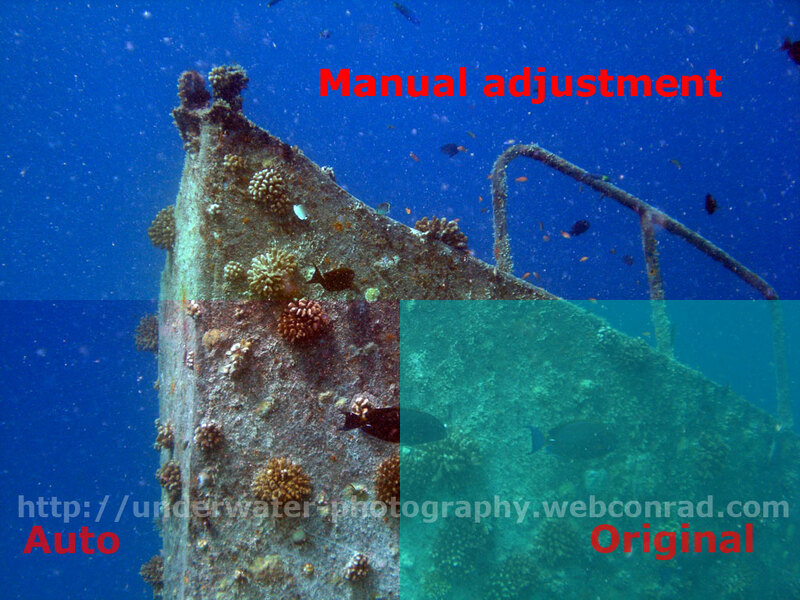 If you had to increase the ISO sensitivity due to difficult light conditions your photos will show noticeable grain. 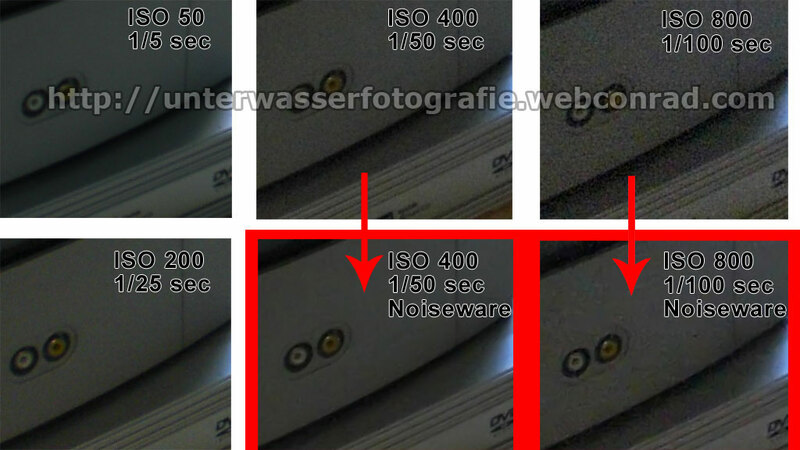 You won't get the quality of an ISO 50 photo out of an ISO 800 photo. But you can still improve the quality appreciably with the free software Noiseware Community Edition Standalone. Sift through your videos and only keep the best.